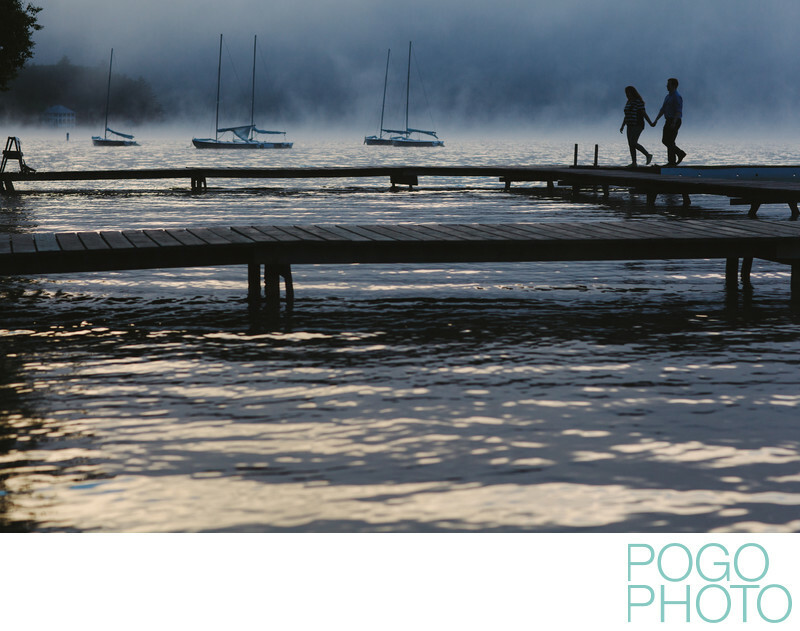 Choosing a favorite place for their engagement session was easy for this couple: their upcoming wedding is scheduled for summertime in Vermont at Aloha Camp on Lake Morey, and exploring that location with us was the ideal way for us all to get to know each other and to get to know the location for the wedding day. Sunrise on Vermont lakes is typically beautiful; as the sun's rays start to warm the rising mist, the fog burns off into brilliant morning light, but the predawn monochromatic softness is breathtaking. This image was taken from one of the long docks at Aloha Camp looking across to the other swimming docks, with the moored sailboats looking like they're still sleeping in the background. Using intersecting lines and a silhouetted exposure keeps the viewer's eye moving throughout the image, and the implied duotone of the image, with the highlights in slightly peachy shades of pink and the shadows still deeply blue, is precisely what it looked like to the naked eye. Using our trained documentary photographer skills to establish a story within the course of an engagement session, which is often a very posed and setup type of shoot, is our forte, and we thrive on working with clients in locations that speak to their hearts. Location: 2039 Lake Morey Road, Fairlee, Vermont 05045. 1/2000; f/4.0; ISO 400; 85.0 mm.